Although the book is under a lot of controversy, the essence of the novel was truth. James Frey might have slightly taken it a little bit away from it which is apparent, but it is somewhat justifiable. He needed to make it seem real and interesting which couldn't have been done without distorting the real story a bit. What I really like about the book was the last scene when he dips the tips of his nose into the alcohol and looks at himself in the eye. That moment is the epitome of all things addictive. Addiction is such a heartbreaking matter to deal with and this book is inspirational. 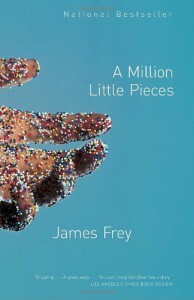 James Frey can offer a lot in the world of writing as a great author; A Million Little Pieces has shown that. I had a thoughtful time reading this book and overcoming fears is not an easy job. I am happy that I read A Million Little Pieces as I am somewhat frustrated to never be able to know how much amount of truth was in it.